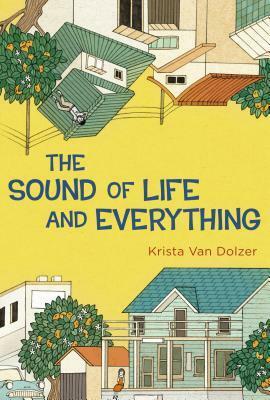 The Sound of Life and Everything by Krista Van Dolzer. Grades 5-8. G.P. Putnam's Sons, May 2015. 262 pages. Review copy provided by publisher. In 1950s California, Ella Mae's family is still dealing with their grief over losing Ella Mae's brother Daniel and cousin Robby in the war. When Ella Mae's Aunt Mildred responds to an ad in the paper claiming that scientists can bring Robby back if she has a sample of his DNA (which she does - the blood on his dog tags), Ella Mae thinks she's crazy. Crazier still is what happens next. It wasn't Robby's blood on the dog tags, but the blood of a Japanese soldier. When Takuma is brought back to life, lost and alone in this strange land, Ella Mae's mother ends up taking him in. But anti-Japanese sentiment runs strong in this small California town and it won't be an easy ride for anyone. This is a strange and beautiful little book. At first, I kept trying to wrap my head around what was happening, but eventually I just had to let go and enjoy the ride. This book combines a historical setting and characters and a science fiction premise in a really interesting way that harkened to classic science fiction stories like Robert Heinlein's Stranger in a Strange Land. The small community of St. Jude, California (a fictional town) is still reeling from the war. Families are mourning their losses and anti-Japanese sentiment is strong. Imagine if a Japanese soldier was plunked down in the middle of this community. In addition to dealing with racism and battle scars, the townspeople must grapple with the fact of Takuma's "unnatural" origin. He was born a person and died and then was brought back to life in a lab. Ella Mae quickly dismisses all of these issues as she gets to know Takuma and comes to care about him. Her older brother died in the war and Takuma is not only a brother figure, but he's someone who desperately needs her help. She's determined to teach him English so that he can express himself and maybe bond with others in the community. I think this is a story that's going to stick with me and I'm going to be thinking about it for a long time. This one was billed as a good read for fans of When You Reach Me by Rebecca Stead, and I think that's a good comparison.